201 Tanjong Rhu Road. Completed: 1995. Total no. of units: 152 condominiums. Living/dining - marble tiles. Bedrooms: parquet. swimming pool, tennis court, squash court, playground, BBQ area, jogging track, 24-hour security system, clubhouse, covered car park and multi-function room. Countryside resort ambience. Low density. Not as crowded as Pebble Bay or Costa Rhu. Sea views from higher floors. Photo 1. 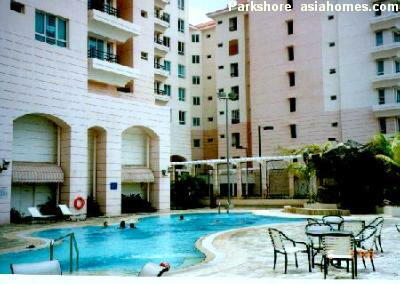 Pool and Parkshore apartments with balcony. Photo 2. 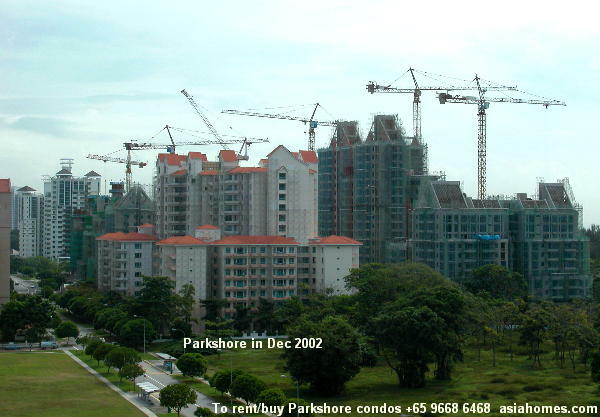 Foreground: Parkshore Condo on right side, Pebble Bay Condo on left side. 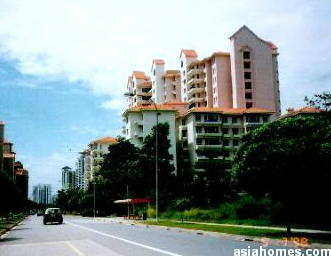 Background: Tanjong Ria Condo (triangular roof), Casuarina Cove opposite Tanjong Ria Condo and Waterside Condo at furthest end (where the road "ends"). Photo 3. 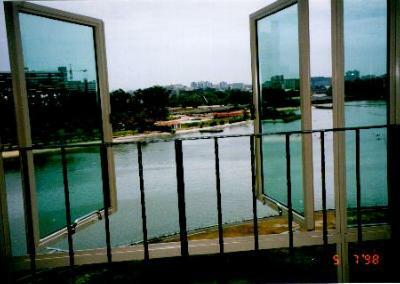 Parkshore 3+1, 1700 sq ft, $4,500 10th floor. Panoramic sea views all rooms. Living room with balcony and sea view. Photo 4. Parkshore. Same unit as Photo 3. Ensuite master bedroom with sea views. Photo 5. Parkshore. Same unit as Photo 3. Bedroom with sea view. Photo 6, 7, 8 & 9. Costa Rhu 4+1. 8th floor. Livonia. 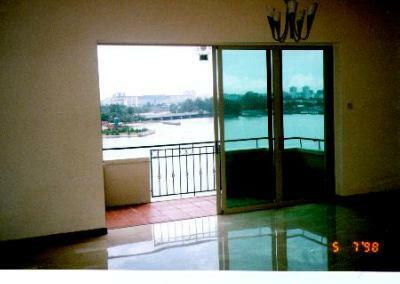 Panoramic river front view, living room and master bedroom and ensuite guest bedroom. 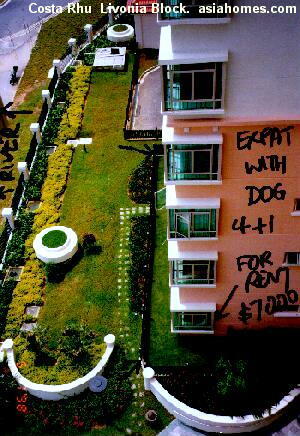 Advert by Owner: Parkshore 3+1 renovated $6000. All terms and conditions to be in writing. "I am flexible" said a busy senior civil servant in a government ministry when asked whether she would be prepared to negotiate on furnishing allowance. When asked for proof of ownership of condo, this government officer said her husband was joint owners and she would receive the good faith deposit cheque payable to the husband. For some reasons, she did not fax over the proof of ownership. 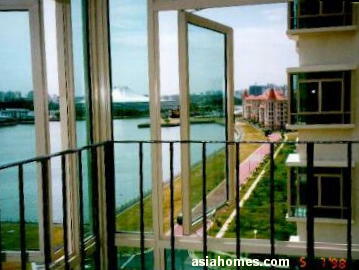 The Singapore government servants are reputed for integrity and the Asiahomes associate accepted her word. Issue: Lease terms and conditions in Landlord's tenancy agreement provided by the Landlord differs from the Letter of Intent. Rental for the Costa Rhu unit was $5,000 fully furnished, with $500 for the Tenant to pay the utilities and maid's services. 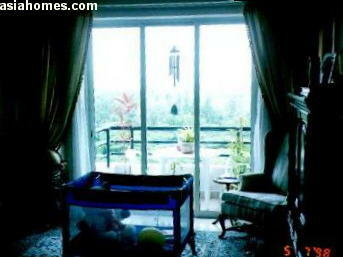 3+1, 1776 sq ft, Costa Rhu, Charonia block, panoramic sea view from bedrooms. "Don't worry, I know what to buy for Tenants" said the confident civil servant. She would not have reached that level of management if she had not been domineering. "You will get a black sofa set?" 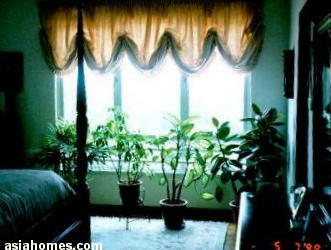 enquired Asia USA associate, as this is the commonest practical (cannot see dirt and last longer). The answer was black. The Tenant wants his own choice of colours and Caucasians dislike black lounge set. The servicing of the air conditioners by the "Landlord" changed to the "Tenant". Agreement of the Landlord to pay the Tenant $500/month was not stated. Asia USA advised that the $500 be paid via Asia USA as management agent. "My lawyer said it is not permitted for Asia USA to receive the $500 and anyway, it is not mentioned in the Letter of Intent" said the flexible landlord, after the good faith deposit had been given to her husband. What has the lawyer to do with this? Asia USA believes there is no statutory requirement stating that the managing agent cannot receive $500 on behalf of the Tenant. It is a contract between the Landlord and the Tenant. The rationale for this procedure is that the Tenant (being a government authority or even a corporation) would not accept a precedent of rental housing being rebated to the Tenant's employee (the Occupant). The Agency does not accept a fee from this arrangement, but use it to close the case and get referrals from the Tenant for a good job done (saving money for him). In this case, the company would like accept the $500 being payable to the agent monthly and the Tenant does not need to pay from his pocket the utilities bill. (Rental being $4,500 although he has a $5,000 rental allowance).
" 2 matters I am uncomfortable with," said the Tenant with a patient voice. We are uncomfortable with the fact that the lease agreement now shows the name of the landlord different from the first copy (faxed direct by the Landlord). The good faith deposit had been paid to Mr L and now the 2nd copy (unknown to the Realtor) showed Ms S. Please get the cheque back"
The Company, being a British government body, would not want me to accept the $500 monthly and therefore, we would have to edit the lease agreement as $4,500 instead of $5,000. Is that all right?" There needed to be more explanation that Ms S was the only Owner while Mr L (the husband) had no shares in the condo. Lease would commences 4 days later and here, there was a problem of bona fide ownership. If the flexible "Landlord" had faxed over the proof of ownership, she would know that she was the owner and there was no point giving the cheque to her husband. Asia USA normally insert the names of co-owners in the lease but in this case, the Landlord said it was all right. (Advices to new realtors: You have to be very cautious as there are scams going around. In this case, the Landlord being a government employee, we thought she was OK but you can see the problem with not following the SOP (standard operating procedure, SOP). 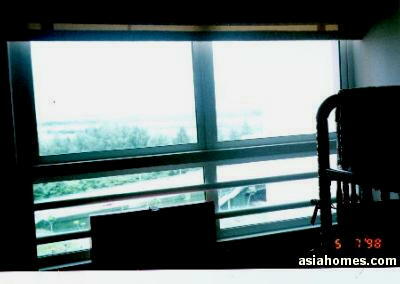 After accepting the explanation that Ms S was the genuine Landlord, Asia USA had to control the damage. As time was short and the Landlord was having meetings, we issued a cheque of $5,000 to the Tenant and get a $4,500 cheque as good faith deposit. We had to rush to the Landlord's house to collect back the $5,000 and gave her the replacement good faith of $4,500 & 2 months' security deposit of $9,000. The Landlord's lawyer (being paid by the Landlord) obviously had to give his advice that the realtor should not be trusted, without realising that this advice could result in an aborted deal. The spirit of flexibility was just not there with Ms S.
Advices to new realtors: In such cases, the landlord wants to be "do-it-yourself" and there is no point in countering her decision as your time and energy would be better spent on other matters. Communicate with minimum words as this is a domineering type of Landlord and you get into unhappy situations when you offer advices. Prepare Letter of Intent with terms and conditions agreed by both parties and commission agreement payable by the Landlord. Or go straight to the Tenancy Agreement. Ask the Landlord for proof of ownership before giving the good faith deposit. Or check the relevant government websites. 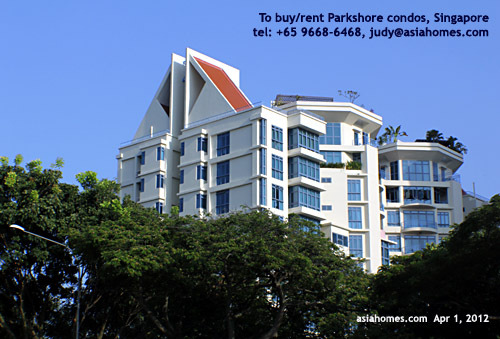 In private condos, unlike the HDB, the person paying the maintenance fees or property tax may not be the owner. Prepare the lease agreement incorporating agreed terms and conditions in the Letter of Intent simultaneously and get both parties to sign if there is no initial Tenancy Agreement provided by the Landlord (corporate landlord usually provides this agreement). Get utilities and phone installation work done for Tenant. 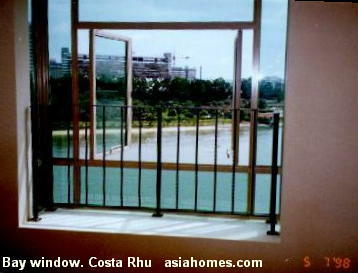 For new condos such as the Costa Rhu, the agent may need to be present for installation of gas meters. Handing over. Get inventory lists checked by the two parties - landlord and tenant and yourself as the agent. UPDATE IN 2011. CEA prohibits "dual representation" by one agent. So, you cannot act for both the Landlord and the Tenant if you want to keep your licence.